Do You Know What Some Common Chicken Health Problems Are? While chickens are relatively healthy, there are some common chicken health problems that you need to be aware of. More people than ever are looking into raising chickens in their backyard and it's not just the owner's of these chickens that need to be aware of these health issues. 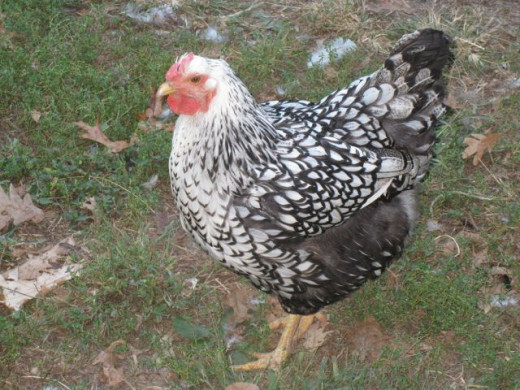 If you own chickens or are thinking about purchasing a few hens for your backyard, you need to familiarize yourself with the various illness and chicken diseases that your flock can contract. Not only will it impact you and your flock, but it could potentially affect the health of other flocks and people around you. Being able to quickly identify any health problems with your hens is imperative because the sooner you diagnose and treat your chicken health problems, the better it is for your entire flock. Some illnesses spread very quickly and can spread to the entire flock in a flash. Did you know that chickens tend to hide that they are sick until it is too late to help them? It is very important to monitor the behavior of your flock very carefully so that you know how they normally behave. This will make it much easier to notice any odd behavior. There are a variety of common chicken health problems that you need to be aware of if you are going to own your own backyard chickens. Most chicken health problems will affect their air sacs, lungs and air passages which obviously will lead to respiratory problems. Every living animal needs to be able to breath easily or it causes distress. Parasites clog up the airways and make it very difficult to breath. Your chickens will eventually die a slow and painful death if they are not treated quickly. The very first step to helping prevent some of the most common chicken illnesses is to keep the area where they live very clean. I have chickens myself and I know that this is not as easy as it sounds. 1. Make sure that you don't have too many chickens in one area. Overcrowding causes stress and can make them get sick more easily. You may have to find homes for some of your girls if you have too many. Another solution is to either enlarge the chicken coop and run or build another chicken coop and run so that you can separate some of the hens. 2. You will need to spend some time each and every week cleaning out their living areas. Depending on the type of bedding that you use, it may involve raking out debris or hosing the area out. Once a month I hose down the entire area and during warm months or day I scrub all of the nooks and crannies. This is harder to do in the winter months. 3. Monitor your chickens carefully for any signs of strange behavior and IMMEDIATELY separate any birds that don't seem right. You don't want a single bird to infect the entire flock. Either treat the bird yourself or contact a local avian vet. The two biggest and most common health problems that you can affect your flock are mites and lice. There are many different types of these parasites that you will need to look for. Mites can infest all types of poultry, not just chickens. Unfortunately for all bird owners, mites are easily spread from wild birds in your area as well as rodents that visit your property. Constant vigilance is very important since they can get infested even if you perfectly maintain their living areas. 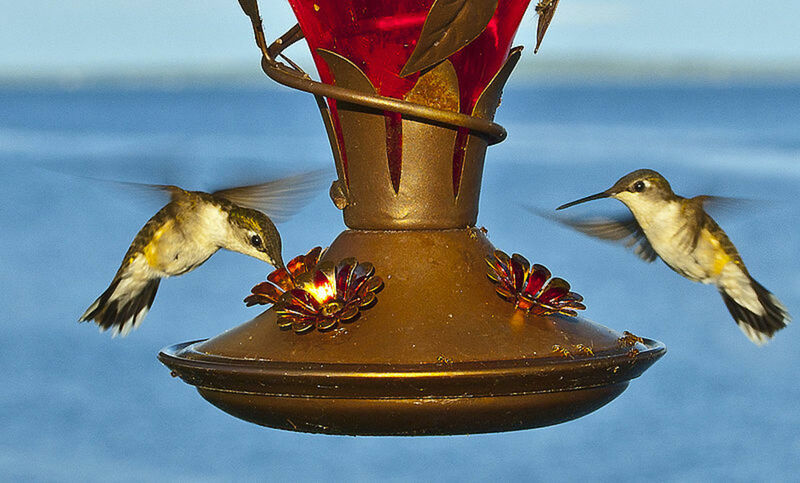 If you show your birds, you need to check them for an infestation before you bring them home. Number one, you don't want to spread mites or lice and number two, you need to be aware that they may pick them up from affected birds at the show. You will need to treat them as quickly as possible. I recommend keeping show birds that have just returned from a show separated from the rest of the flock for at least a week to make sure they are still healthy. Should You Worm Your Chickens? 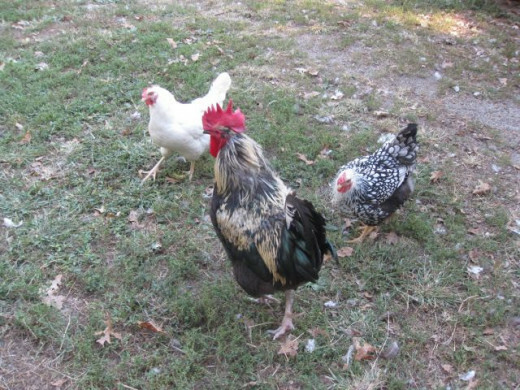 If you have backyard chickens, you need to consider worming them. It is very easy for them to pick up parasites and they can affect the health of your chickens. Learn about the types of worms that your chickens can become infested with. Worming Chickens - Do You Need To Worm Backyard Chickens? Learn about worming backyard chickens. Chicken mites The most common form of mites are chicken mites. These parasites live on the actual skin of the birds, in the bedding and in the nesting boxes. They are extremely small parasites that are a yellowish gray color before they feed and then they turn red after eating off your birds. They are nocturnal only and will hide in crevices during the day. You don't actually need to treat your chickens for this parasite. These mites can be managed fairly easily by regularly cleaning your chicken coops and nesting boxes. Scrubbing and disinfecting works very well with these parasites. They are fairly easy to kill will mineral oil. You will need to rub it over the bottoms of the nesting boxes, along their perches and the walls. It is messy but cheap and effective. The oil works by blocking the mites breathing pours and they die. The mineral oil is great because it won't hurt your chickens or their eggs. Northern Foul Mites These are nasty little parasites that live on your birds and feed on them around the clock. They are tiny parasites that are a reddish brown color. You can usually tell if your chickens are infested because they cause the feathers to be discolored due to the parasites waste and their eggs. If your chickens are infested with these mites, they will be weak, won't eat well, will look very thin and their egg production will drop. These parasites can kill your birds so you must monitor them carefully. With this type of infestation you have to treat the birds directly since the parasites live on them. Scaley Leg Mites This type of mite lives on the legs and feet of the chickens on their scales. The scales will look raised and will separate from the skin of the bird. Your chickens feet and legs may swell up and you may notice that there is a discharge coming from their scales. Again, you have to treat the birds directly for this type of infestation. Poultry Lice Lice are another cause of chicken health problems that you must control to keep your chickens healthy. There are a lot of different types of lice that can infest your chickens and the type of lice your chickens have will vary depending on where you live. You may need to consult with an avian vet in your area to determine what types of mites are common where you live. Lice are tiny insects that don't have wings and they actually feed on your chickens skin and feathers with teeth. The affected chickens will have skin irritations, will be weak and egg production will drop. They will look terrible as the infestation progresses and it will be obvious that something is wrong with them. Be sure and change your clothes, shoes and socks before you go near your house or visit someone that has chickens. You can very easily transfer them to another flock which would be awful. Be sure and warn anyone that comes to visit that your chickens have mites and don't allow anyone to handle them. As discussed earlier, the best prevention is to keep your chicken coops and nesting boxes as clean as possible. Set up a regimen to regularly disinfect them with soap and water. But sometimes even the cleanest chicken coops and the best cared for chickens will suffer from chicken health problems. Once you are dealing with infested birds, first remove all of your nesting boxes and all bedding from your chicken coop. Clean and disinfect everything that you can get to. If you can, move your chickens to a new area for a few months until you have a chance to get the infestation under control. Notice I said "under control" instead of "eliminated" because once you have an infestation, it is almost impossible to completely eradicate them. You just have to try to control them. Then you will need to decide what type of treatment is best for your flock. You can purchase Sevin powder to effectively get rid of lice and mite infestations on your chickens. You can use it directly in your chicken coops and on the chickens themselves. Re-treatment will be required in order to stop the life cycle of new eggs that weren't killed the first time around or your chickens will be re-infested. Another product that is not toxic is called Orange Guard and it is an extremely organic treatment that you can use in your chicken coops but it cannot be applied directly to your chickens. For Scaley Leg mites, you can try using a variety of oils like mineral oil, vegetable oil, Vaseline, etc. You have to capture your chickens and apply it very heavily to their legs and feet. Unfortunately this has to be done every two days until your chickens are no longer infested. A better way to treat Scaley Leg mites is to use Adams Flea and Tick Mist (with IGR). You can spray their legs and feet and then massage it in to make sure that you have even coverage. While it is more expensive initially, works on adult mites and their hatching eggs which is great. It is also cheaper in the long run when you factor in the fact that it works for three months at a time. I mark my calendar and just treat my entire flock every three months like clockwork. The hens and roosters hate it but oh well. I catch them all after dark to save myself a lot of grief. Foot problems are very common in chickens. Keep in mind that they only have two feet and if one is injured, they are going to have mobitlity problems. The stress of hobbling around on one leg can actually cause problems with the previously healthy leg leading to a chicken that can't get around at all. If you notice one of your chickens having trouble getting around, catch that chicken and take a closer look. See if the feet are cut, have an absess or bliste or is swollen. If you notice any problems, it's best to separate that chicken from the flock until it has healed. That way the rest of the chickens won't pick on the injured one and it will have time to recover. It won't have to endure being chased away from food and water and it can actually rest and recover. Older hens may also develop arthritis. There isn't much you can do except try to make things easier for your hen. Provide perches that are various sizes so that she can pick the one that is the most comfortable for her. Provide ramps for easy access to perches so she can climb up and down without having to land on her feet. Can I use electric fencing to keep dogs out of my yard. 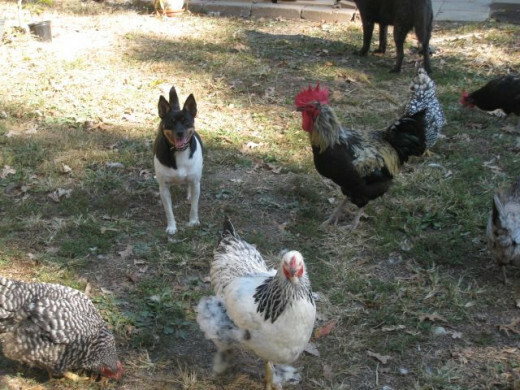 I lost several chickens to two stray dogs this summer during the evening and I was fed up. Their owner's refuse to keep them contained in their yard so I bought some electric tape and installed it around the perimeter of the area where my chickens are allowed to roam free. I sat in a lawn chair and waited for the dogs to arrive that evening. The first dog attempted to weave his body through the two strips of electrical tape that I installed, got zapped, yelped and ran for his life. The second dog approached more cautiously and merely touched the electric tape with her nose. She also got zapped for her trouble. She didn't run but laid down outside of the electric fencing and I suspect tried to figure out how to get through it. Neither one has been in my yard again so as far as I'm concerned, it worked for me. Your chickens should not get shocked themselves as long as they can safely run under the wire and clear it without touching it. Whether it is a dog, a chicken or a person, a shock is only delivered when the dog, chicken or person is touching the ground and the fence at the same time. Click here to get more tips on predator protection to help keep your flock alive. I designed this lens to provide general information on chickens and chicken care for anyone looking for it. But, you should know that I do this for a living and this website generates some revenue through affiliate marketing. If you click a link and purchase something from that link, I will make a percentage off that sale. Debbie Vornholt is a participant in the Amazon Services LLC Associates Program, an affiliate advertising program designed to provide a means for sites to earn advertising fees by advertising and linking to amazon.com. @Millysmother: It sounds like she still has mites. 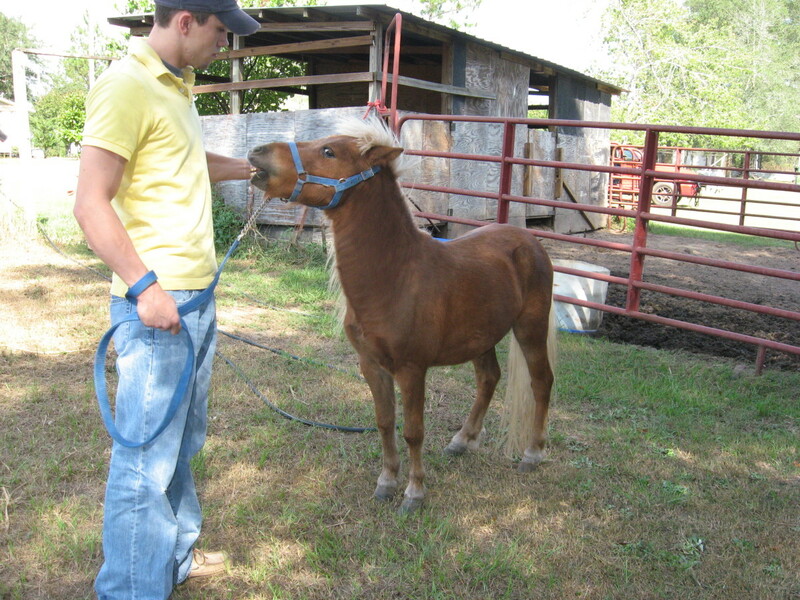 They can be very difficult to get rid of and you typically have to treat more than once due to their life cycle. You may have killed the adults but not the eggs. Be sure and treat the entire area the hen is living in. A friend of mine had such a bad infestation one time that she actually had to replace her hen house. A good treatment for mites and lice is to get some wood ash for your chickens to dust bath in. Sevin Dust I found out has been banned for use on poultry. There are other treatments like poultry sprays. Treat by spraying on the chicken and on the roosts, nesting boxes, everything. I use Garden &amp; Poultry dust to help prevent (not treat) mites and lice. They are many other treatments for these parasites. You can try covering the affected areas with petroleum jelly which will prevent new eggs from hatching and it is said to actually smother existing mites. My hen milly has been treated for red mites.. But the skin on her face is very sore and inflamed.. I guess this was coursed from her scratching.. What can I use to help her skin heal? Please help? Great lens! I love to see the sustainable living movement taking off. Thanks for the info. @Country-Sunshine: I agree. The best way to end up with health issues is to have your chickens living in filth. I've raised chickens, ducks &amp; guineas for several years.. for eggs &amp; as pets. Great info on the health problems. Cleanliness is the most important deterrent to problems. Chicken is good as meat and at home. They clear some insects you may never be able to. This is a great lens. It is very informative. Thank You! @queen2010: Thanks for checking it out. @grafixforacause: You have that right! I recently wormed my chickens and had to do with storebought eggs. Needless to say, I haven't been eating too many eggs because they just aren't the same! What weeds! I love my chickens. @william_davis: Thanks for the comments. I have 16 of them, and I can tell you nothing beats a fresh free range egg. Not to mention they are great weed controllers!